Mail4Rosey: Baby Banz for Swimming! Disclosure: I received a product in exchange for the post. All opinions stated are genuine and my own. When you use a rashguard for your child, do you purchase long-sleeves or short-sleeves? I've always, until now, selected the short-sleeves, thinking the longer length ones might be too hot. Well, I'm here to tell you that's not so! The long-sleeve rashguard from BabyBanz is as comfy as the short-sleeve shirt, and you get more protection. There's no need to expose your little one's skin to the sun for prolonged periods of time, and if it's this easy (and stylish) not to... I say why wouldn't you have this kind of shirt for sun and swimming? 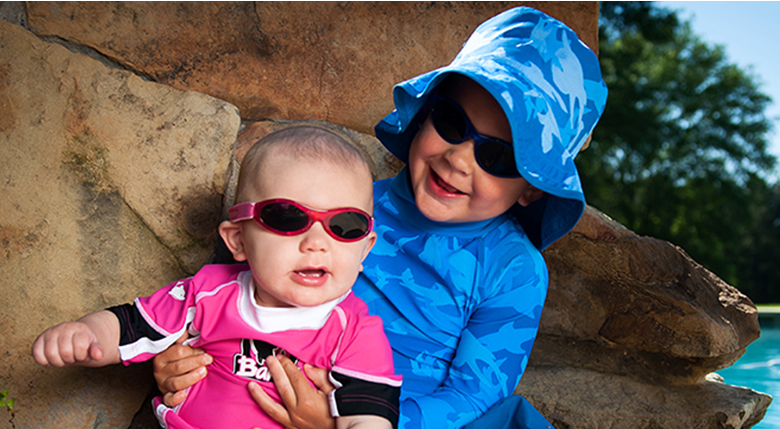 Baby Banz Rash Guard Shirts come in a variety of colors and styles. With a UPF 50+ rating, these shirts are amazing for protection. Add the matching board shorts and you've just got a really cute set! Designed originally in Australia, this line of swimwear knows a thing or two about being out in the elements. The material on the shirt is 82% Polyamide and 18% Spandex. It provides a loose fit for comfort and it dries rather quickly! The board shorts also have a UPF 50+ rating. They are made of polyester and they have a mesh lining. There's a handy pocket on the side for your little one to keep something small (like spare change for sno-cones at the pool!). I think the swimwear line is stylish and cute. You can learn more about BabyBanz by visiting the website. There you'll find all kinds of cool and very useful things for your little ones on the move, outside, or on the go. You can also follow along on Facebook and/or Twitter. I think all kids need to wear these. The sun is beautiful, but be aware that it can hurt. When I was in FL I saw a baby with a sunburn...broke my heart. I bought these for my kids and I loved them. Even as they have grown I have kept them in spf 50+ swim shirts. Even I have starting wearing one. Better t protect now than to pay later. As a Florida mom, I always did what I could to protect my kids' skin from the sun. These are awesome. Great sun protection. That is key. I Had Baby Banz for my boys when they were smaller. They were awesome. I love that the Swimwear has an SPF factor! That is so wonderful! They look adorable! Perfect items to keep your kids protected from harmful sun rays, i love using this protective gear for my kids when we go out to the beaches, water parks, and lakes. I love seeing more clothing coming out that protects against the UV rays! Sounds like a super comfy brand! I just bought my granddaughter a UV swimsuit. I think it's very important to protect yourself against the strong rays of the sun. Super cute. We didn't really let broxton get too much sun as a baby.. i was too nervous.